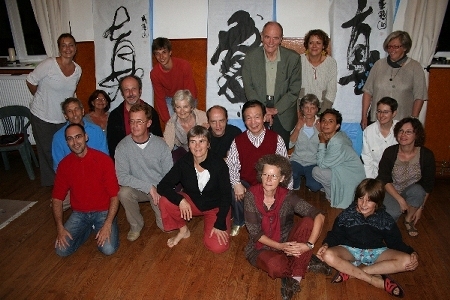 Between the end of August to early September, 2009, Master Sei has visited Strasbourg in France to hold Chi Kong seminar. Official name of the seminar is “Orient Medical and Wisdom School”. Principal of the school is Nourit Masson-Sekine. She was Master Sei’s student when she was living in Japan. 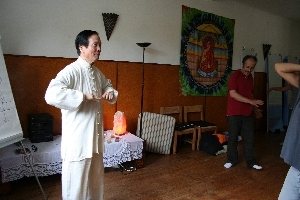 Master Sei while he was giving lesson to students in France. 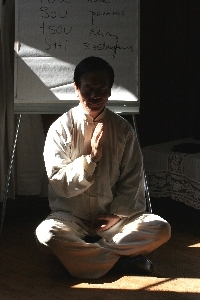 Students are learning Zhan Zhuang (Heaven Earth and Human method). Scenery of Automatic Movement Kong. Everyone is moving in their own way. →　Continued to Seminar in France 2.